The history of New York City’s parks dates back hundreds of years to New York’s Governor Thomas Dongan who granted the Dongan Charter of the City of New York on April 27, 1686. Part of this charter officially put all waste, vacant, unpatented and un-appropriated lands for the very first time under the jurisdiction of the Common Council. These un-appropriated lands under the Common Council included outdoor marketplaces and public commons that became the city’s first parks. Some of the earliest parks traced back to this charter were Bowling Green Park, Battery Park, and City Hall Park. The first official park in New York was Bowling Green Park in 1733 located in what is now downtown New York City near Battery Park. It was around the 1730's when the first sightings of public buildings began to emerge, with the opening of the city’s first Almshouse that was built around the site of City Hall (NYC Parks). The primary function of the Almshouse was to house the poor, the infirm and the impoverished such as widows and orphans (Archaeological Institute of America). Even as early as the 1700’s this public space or “commons” in New York City were used to provide housing for these people in poverty. It was around the 1850’s where the park movement in New York gained momentum when citizens began to voice their concerns overcrowded conditions in the city, which had grown from 97,000 in 1811 to well over 500,000 in 1850. 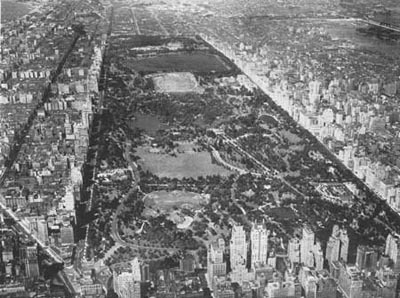 Citizens argued for a large central park to alleviate some of the crowd congestion. With the help of crowd support and politicians including the construction of a large city park in their political platforms within two years the building of Central Park began. A similar event occurred in 1859 when populations in Brooklyn began to increase, residents wanted more parks to relieve what was described as the “swarmingness of the population”. This in turn led to the building of Prospect Park for the people of Brooklyn (NYC Parks). Due to the growing population in the city around the 1800’s, on May 13, 1887, the State Legislature passed the Small Parks Act, which allowed for the city to acquire new plots of land and create small parks in crowded neighborhoods. In attempts to make the parks more recreational and more family-friendly the Parks Department began equipping parks with playgrounds in the early 1900’s. 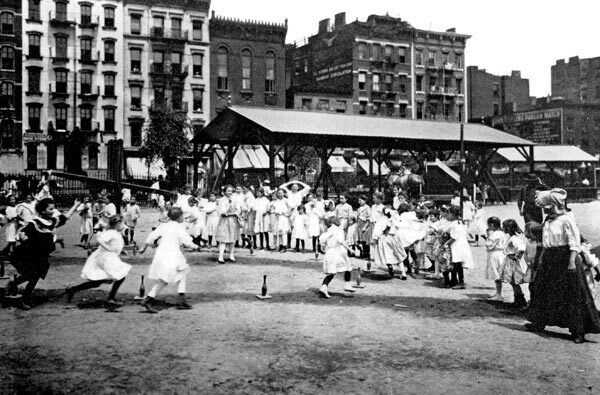 It was in October 1903 that Seward Park, located on the lower east side of Manhattan became the first municipal park in the country to have a permanent playground and this became the model for similar playground developments at other New York parks shortly after. To get kids even more involved and utilize the parks it was around this same period where the Parks Department sponsored athletic competitions along with football and baseball leagues involving thousands of boys, while for girls they were able to participate in dancing, arts and crafts and costume pageant activities (NYC Parks). It was around the 1930’s that chairman Robert Moses of the New York Association’s Metropolitan Conference on Parks issued a report recommending immediate acquisition of the thousands of acres of the last natural areas in the city. This was also the period of Franklin D. Roosevelt’s new Deal helped in development of the parks even further with the building of many playgrounds and recreational buildings such as outdoor pools. Through the remaining 1900’s into the millennium the New York Parks became a place for entertainment with several concerts, performing arts groups botanical gardens, zoos, sporting events and the creation of the New York City Marathon in the 1970’s. In the 1990’s the parks became places for memorials for various commemorations such as a East Coast War Memorial in Battery Park, an African-American burial ground, or a Gay Liberation memorial in Christopher Park. Today the New York City Park & Recreation has about 29,000 acres of land (about 14% of New York City) used as parks or other recreational activities (NYC Parks). "Distinct NYC." Distinct NYC. Web. 13 May 2012. <http://distinctnyc.tumblr.com/>. "Historic View of 1734 NYC Almshouse in City Hall Park." Historic View of 1734 NYC Almshouse in City Hall Park. Web. 13 May 2012. <http://www.geospatialarchaeology.com/album-CHP_large1.html>. "History." Friends of Seward Park. Web. 14 May 2012. <http://www.friendsofsewardpark.org/history-of-seward-park/>. "The City Hall Park Project - Almshouses." The City Hall Park Project - Almshouses. Web. 13 May 2012. <http://www.archaeology.org/online/features/cityhallpark/almshouses.html>. "The Oldest Parks (1686-1811)." The Oldest Parks : Online Historic Tour : NYC Parks. City of New York Park & Recreation. Web. 13 May 2012. <http://www.nycgovparks.org/about/history/timeline/oldest-parks>. "Thomas Dongan (Dungan)." Geni. Web. 13 May 2012. http://www.geni.com/people/Thomas-Dongan-2nd-Earl-of-Limerick/3813386.